The Neuron file is in the zip file. You may need to reboot your computer. 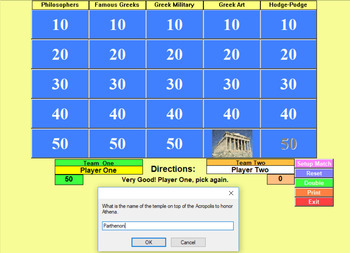 When you start up the GreekQuizShow you need to say or click YES to all the dialog boxes. 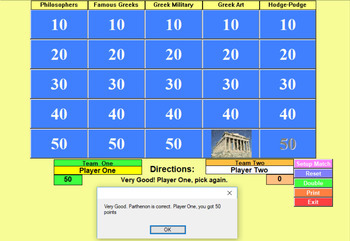 You keep playing until you miss a question - then your partner tries to run the board. Hold down the SHIFT and CTRL buttons on your keyboard. RIGHT Click the Question box. 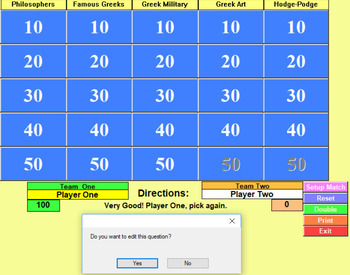 A dialog box will appear asking if you want to edit this question. If you clicked Yes - Then you must choose either a ASK question or a REQUEST question. 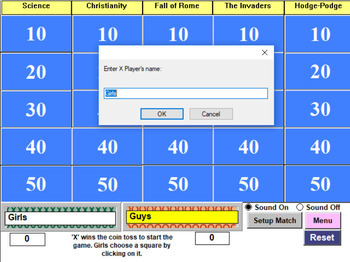 The REQUEST is a multiple choice with three buttons. If your printer is hooked up to your computer then you can print out the answers. RIGHT Click the PRINT button on each page.